Eyelash conditioners and serums are popping up in spas and salons for women tired of the maintenance of false eyelashes, or curlers and mascara. These non-prescription lash conditioners are applied like eyeliner and most can also be used on brows as well. 1. RapidLash thickens and improves the appearance of lashes and brows in four to six weeks. The serum is fortified with polypeptides to increase thickness and volume, proteins and vitamins to replenish and fortify, and moisturizing and rejuvenating agents to add shine and flexibility. E-mail [email protected] comcast.net for wholesale inquiries. 2. Dea Bella Eyelash Conditioner enhances brittle, thin, weak lashes into longer, stronger, thicker lashes. Formulated for faster results by Amber & Linley Laboratory, the company says women noticed dramatically enhanced lashes after two weeks, and it off ers a money-back guarantee. 3. Manufactured by JB Cosmetics, LashFood is an all-natural eyelash and eyebrow conditioning stimulator that results in fuller, longer, darker, and stronger lashes. Lashfood is packed with 16 different types of performance herb extracts, copper complex, and essential provitamins. 4. 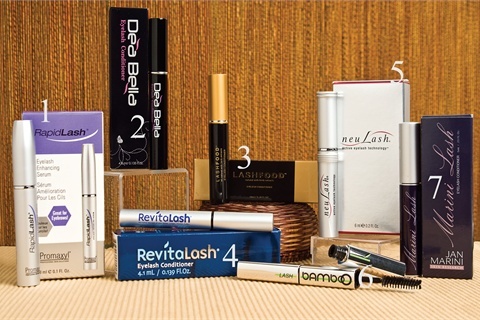 RevitaLash, from Athena Cosmetics, was developed by an ophthalmologist for his wife, whose eyelashes had been damaged from chemotherapy for breast cancer. It helps users achieve the beautiful look of longer, thicker, and fuller eyelashes no matter how thin or short the lashes are. 5. neuLash active eyelash technology offers maximum eyelash protection by delivering essential proteins, vitamins, and moisturizing and rejuvenating ingredients to replenish and strengthen the structure of lashes and brows. Created by Skin Research Laboratories, neuLash is available in its original 6-ml tube and now also in a more affordable 3.2-ml size. 6. Bamboo Lash eyelash enhancing serum, manufactured by Bamboo Cosmetics, uses natural ingredients to tint eyelashes and support their natural growth, making them appear volumized, thicker, and longer. A double-ended applicator with lash brush and eyeliner brush allows for both day and night use. 7. Marini Lash eyelash conditioner, by Jan Marini Skin Research, offers a conditioning formula with a new proprietary peptide blend, which when combined with other factors, produces extraordinary eyelash and brow enhancement.